I just read my sister's blog. Yeah, I received nasty commentS lately, saying that I look old.. I'm fugly. I'm fat.. I’m this, I’m that..
Well.. Usually I just ignore these stupid comments or judgements or opinions whatsoever.. (cuz I kinda used to people judging me before they even know the real me). But since that comment said some nasty things about me and my mom..I can't shut up anymore.. Okay, first of all, I’m aware that my face looks naturally matured - with or without make up. With or without me wearing baju kurung, baju kerja, baju tak kerja, baju berwarna, baju takde warna, baju sekolah or whateverr baju on this earth.. so you don’t have to tell me over and over again. Even in school, when I was in form 1, people thought I was a senior student - Form 6! Obviously, I was wearing my school uniform and wasn't wearing any make up at that time. So, no. Make up is not the reason why I look matured (bcoz some people said that). Or perhaps.. it is just my very own face that looks a bit matured! So what? I’ve never said I look young and cute or whatsoever. And well, I kinda like it you know.. to look a bit matured. It has given me the opportunity to fool other people. Thirdly, I know I'm a bit fat.. When did I ever say I’m skinny?? And to be honest, I hate being chubby. I can't wear and shape my scarf perfectly like my sister could! And I can't seem to wear skinny jeans or high-waisted pants, etc without me looking like a "sarung nangka!". But that didn't stop me from dressing up. Do you expect me to mourn and dress up fugly just bcoz I’m not slim? I've always loved clothes and make up and stuff.. And that also explains why I always find myself wearing slightly older people's styles (young adults to be exact). Like, wide-leg pants, jackets, shirts, blouses, et cetera instead of wearing what most teenage girls would wear - skinny jeans, tubes, skirts, simple tshirts, sweatshirts, hooded tops, boleros, halternecks, skirts, etc.. I need to suit the way I look & my personality with my style. I can't just wear whatever that is on fashion just because everybody else is wearing them. Like for example, the skinny jeans. Most of my friends have at least one, and I don't! Does that make me “old”? Seriously, you don't have to follow whatever is on trend even if you know you won't look great in them! Plus, I have to say that wearing scarf can be tricky if I want to look modish or up-to-date. I don't wanna lose my personal style but still, I don't wanna look like a fashion disaster too! Btw, I have never ever said I'm a 6-foot pin-up girl.. So, what do you actually expect to see when you're viewing my page, gurl?? A skinny model with a perfect face, a perfect body, and a perfect life?? Sorry, you’ve got the wrong blog address. I'm just a normal person, with feelings too just like you (or maybe you don’t have one)! But well.. this is cyber space. I know you can say whatever you want to say without feeling guilty bcoz no one can track you. No one knows if it was you who left such nasty comments except yourself. After all, you did leave a comment anonymously. You’re scared of being tracked, is it? What’s the point of saying those things when you’re such a coward to reveal yourself? What are you trying to prove? Or is it like your own “guilty pleasure”, saying bad things about other people? It just shows your personality and your quality as a human being, you know. And what’s worse is that, you know it’s you. You can’t pretend you don’t know it. And what surprised me the most is that you want to actually be my friend – after all these years?? I thought you hated me so much? (I’m not pointing fingers but siapa makan cili, dia la terasa pedas). I can name a few of them here and now, or maybe attack them back like they did to me, but for what? I know my values. And that differentiates between me and YOU! I am not like you, who make fun of other people's interest or beliefs. Sukati la orang nak suka/buat apa asalkan tak kacau hidup orang lain. Why should that bother you? Why do you care so much if that person is not like what u want them to be?? Unless of course, if you love them. That’s a whole different story then. THIS IS MY BLOG. It's about ME; my likes and dislikes. It’s not about “what you think”, or about your likes and dislikes. So do yourself a favour, just like what I normally do when I don’t like a particular blog (hey, I’m human too). Stop reading my blog if you loathe it. Bcoz really, what good does it gives you by hating and condemning others? The more you visit and read those blogs that you hate, the more negativity surrounds you. You’re circulating negative vibes all around you and that’s what you’re getting more of every day. And just because you have a miserable, empty and unfulfilled life, doesn't mean you gotta make others feel horrible or bad just like you, woman! P/s: Is there a set of standards kalau jadi Datin, u gotta have a set of rambut bulat mcm Doraemon or pakai tudung selendang with super bright red lipstick, gelang and cincin bertan2 macam kedai emas bergerak?? I never knew that. Just so you know, my mom is a very verry simple woman! Even if she does look like a makcik kampung, so what?? What's wrong with being a makcik or makcik from kampung?? Siapa ckp bandar tu bagus sgt?? To others, please excuse this PMS lady,will ya?! i never get it when ppl say u look matured. aku rasa biasa jer. takde la nampak matured, takde la nampak muda. maybe bcoz aku slalu tgk ko kot..
or maybe bcoz muka garang! huhuuu. U can call me Kak farah. I have been reading your blog for quite sometimes , not only yours, but your other siblings as well.What makes me feel like typing a few words here in your comment box is that- I know how devastating and emotionally you could be when an B*****rd or and idiot or we could call these people as an intruder who has nothing except for condeming people and pinpointing others with harsh words! To be frank, these people, there have nothing!! There are comparing themselves with you and your lifestyle..feeling frustrated as they could not get what they wanted, they tend to use nasty and harsh words!You are such a transparent girl who narrates your day by day activites sincerely wothout hurting or invading others..so why on earth must others feel so bad and full of jelousy? Just ignore all those people(smetimes susah nak ignore as it could be really really hurting expecially bila hal mak pon dibawa sekali),but that is the best I think. Dont ever defend yourself about their comments and just give them A TOTAL ignore! That's the best.....Trust me..these people are just a plain idiot who know nothing except for crtiticizing others..so Pedulikan and hey....U GO GAL! but after awhile or years of knowing this little gal, i find it weird y ppl say that to u!! i personally think u r so cute n the way u think or act dont really 'match' ur face!! hehee..
i find it funny u know, that ure face looked so matured but the way u act or talk or think is like sooo kebdk2an..hehe. dun get me wrong, i dont ejek u or whatever..
i just feel that its so weird y ppl hate u, cuz u ni bkn nye kacau idop org pun..huhu..hurmm.. pelik la!! i'm sincerely sorry for having says dat u look matured becuz of u having makeup like ur sisters - n dat what i'd comment in kak hanis's post bout "busuk-hati-bangkai lalat"(diz gelaran kak hanis give to org yg suke kutuk2 tuh). it is only my opinion cuz i havin a sis same age as you too n i'm a year older n...of course she look younger but when she wearing makeup, people will confused which one adek n which one akak..(it's happen bile tyme g raye2 umah org). so then i tOt u maybe look a bit matured becuz of that. Sorry yeh?heh? Q: muke org 20 tahun mcm ne sebenarnye ek? 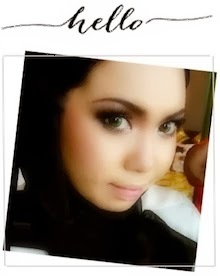 ok lorh adek wany..hv fun wit ur makeup eyh! n mmg seronok pun ade kakak2 like ur 2 gorgeous sis! yes just ignore those baskets who never use their brain to think but always speak with their bekside for their face! it's your blog, don't like it pergi jauh far far, don't need to leave ppl nasty comments for your F*** sake!!! abaikan je wani..lain org lain pendapat..but for me, i love ur style..
but u..even ur still young i proudly say that u REALLY REALLY manage to handle this kind of thing VERY WELL..of coz in a polite way!.. i adore u tak senang mengamok or sawan bile org ckp u mcm tu..hahah..good wani! i think the way u dressed up shows that u know how to have fun. tu yang mereka jealous tu because maybe they cant be like u, perhaps? and meeting u at hariz's birthday bash (i dont think kau remember pun) dan kau berjoking dgn ur friend pun tau ur gile weng2 ok.
org tua je xkn buat mcmtu. xde sape pon yg perfect kt dlm dunia nih.....nobody!!! just dont bother bout all those nasty comments.. they are all sick ppl who have nuthing better to do in life.. i think they just envy u n ur sistas..
yeah.. i wud be dsturbed too if anybody ever kutuk my mom for no reason! gile la diorang tu semua! ignore what other ppl say about u cause you know yourself better!! u look beautiful and i love your clothes! Actually my name is Wanie also, just different spelling. Love reading your sisters and your blog. I think people were just jealous with you and your family. Just ignore them. Even if you look matured from your actual age, you are happy with your life. That’s more important than look younger and slim but not even happy and always feeling unsecured. You are surrounding with families and friends that love and treasure you as you are… so don’t worry. What they really know about you and your family? What important that you knew that you are fabulous and have a wonderful family. I think biasa la kalau bab physically matured kan? why oh why ppl mesti nk pertikai mcm tu? Kan Tuhan dh jadikan kite sempura. Well at leats eprfect. Btol tak? and kutuk mak org? gossh..mcm bdk2 tadika la nk ejek mak org nih. Haih..wats up with kampung? Hina sgt ke org kg ni kan? isk2..
pedulik apa orang nak kata..orang tu jealous dengan u tu..
personally i think you are stylo and pretty..
do take care and PM dengan orang yang cakap u nampak tua tu..
Barang from gap/old navy dah sampaii..nanti i hantar k! just stay the way u are..
sama la u ignore jer. Ok kalau you nak tahu adik I pun org ckp dia lagi matured dari I sbb muka dia, gaya and presentable dia. Bila org datang umah mesti tanya I kakak(adik sebenarnye) u mana? lantak pi la ape org nk kate...lama2 diaorg diam gak..
nk tutup mulut sume org mmg ssh la..
i look ugly, fat, dh la itam..what do i care...as long as i got someone that loves me..itu yg penting..kan kan kan..
i can't believe such human existed in this wprld..but i've been there too.. u know what?i totally agree with u on "Kutuk orang sana, kutuk orang sini.. But at the end of the day, they will eventually like/love that poor little person. Or at least, they'll become like the person that they used to kutuk. I’ve seen it myself.". i've encountered this situation before where an alien from planet L just hated me more than anything in this world but at the same time she's immitating/copying/xeroxing whatever the hell i'm doing, i'm wearing,i'm saying,i'm watching,etc..so just let those losers be anything that they please, but we should lead our interesting life to the fullest..things that doesn't kill ya will only makes u go stronger honey!!! hai there..i read ur blog since i know ur link..i also read ur sisters blog too..and i just love it! !i agreed that u look matured but u r so stylish and that suit u..so what?? Don't worrylah wanie abt other people comments. Lantaklah apa dia org nak ckp. Btw, enjoy reading your blog. be yourself & ignore others. wani..if lately u dah start receive hate mails..itu maknenye u dah glamer! hik2!saye gemolike..if seblum ni u tak receive hate mail..tu bukan bermakne org suke u..tu maknenye u blum dikenali. hik2. anyways, diorg jeles la tuhh. i suke tgk ur style.classy!! like ur sister said, u're the most daring. and sape yg kate u gemuk tu? bute ke ape? wani tak gemuk la?! may be u have a round face SHAPE kot. as we know..kan ade square shape, oval, heart etc etc..so urs just happened to be round..tp u still cantik ape? btw, i rase ur mom cantek gak.my aunty is a Datin..omg mekap die punye tebal i think bole la 2-3 org pakai that amount.and rambut die mmg doraemon haha. i wish she dress down a bit lah cuz kadang2 balik kampung buat tergezut org kampung jer..kalu nak pi functions bole la mekap 3 gantang kan.
haha okeh saye sudah mule merepek sila beredar skrg. time kasih. P/S: u know what i like abt u n ur sisters? all of u r wearing tudung but y'all still look great and stylo!!! my goddd. whyyy on earth dia cakap pasal ur mum! i like to look at ur mum. its better to be simple than a person yang tahpape konon2 nak jadi datin kan? nway u, as ive mentioned in my blog, has great sense of style. so yeah, that person is definitely jealous of u.
sbb tu lah dia anonymous. Org yg bg komen tu jeles/dengki sbb dia x stylo cam u.Hehehhe. p/s...my mom n sister pun datin tak ikut acuan "datin" set2 rambut ni...so what kan? i couldn't agree more with diana and nor.. you are waaaay matured and your inner self reveals sooo beautifully, just like iza. but i don't think hanis potrays the same though..have fun girl, you deserve it! ignore what others say,you know yourself more than they do..so peduli apa org nk kate!me + other readers just love your style. i noticed you are rizman ruzaini's fan eh..may i know how much a dress cost eh? i mean range harga die..and kalau wedding dress bape plk eh? i love their creation..maybe if this is personal you can email me at greenflower84@yahoo.com. Thanks and stay cool eh! org yg kata tu sememangnya dengki...kesian deme...kenapalah x da ubat untuk org yg hasad dengki nih...ubat utk awak bersabar, ur family with u and the bloggers juga with u including me... u always sweet to me n x gemok pun. adoi la. pnjg benor entry kali ni. walaubagaimanapun, saya sooooka blog kamu, dan juga baju kamu, dan juga kasut kamu, dan juga seluar kamu, dan juga tudung kamu, dan seterusnya. jadi ringkasannya, teruskan memblog tanpa mempedulikan mereka yang busuk hatinya. Ya, tuhan itu adil jadi kenapa kita perlu memeningkan kepala kita memikirkannya. serahkan semuanya pada DIA. tugas kita? ber-style selagi mampu. komen saya pon dh panjang. jadi sy stop dulu ye. what wani is trying to highlight in this entry was more about her. not about my mother. I was just defending my mother. and i am sure you will do the same too if someone say something bad about your mother. and oohh pls stop asking me to be " cool" or act as if i felt nothing and just pretending as if i was ok with the harsh comment. And again that is my blog. It's about me, what i feel. not how you feel ok? IF u want to find someone perfect inside out u got a wrong address. wani sometimes you have to fight back. bukan cakap dgn nada sopan santun coz this people are so stupid! melampau gile la wei org yg ckp muke u cm tue ke ur mom tu mcm mane ke. padahal xlangsong. thats ur natural face. nak wat cmane lg kn?? thats very lame. seriously kalau tak suke tgk blog wani ni tolongla berambos jgn datang masok blog ni lagi kalau takat nak tglkan komen2 busuk die tu. xde sape pon nak dgr sume tu kt sini la wei. n wani lantakla org nak ckp u cm ape ke. at least u are being urself. nape la dorg tu jelez sgt. ee geram pulak i rase. padahal org yg tulis tu mst buruk dan suke pk die cun. yg die nampak buruk org je n jelez tgk org laen sng dan digemari ramai. seriozly die mst ingat die da up abes sbb dpt kutuk2 or hine2 org cmtu. padahal die yg buruk dan sgt xseda diri. toloooongla. n wani, ktorg still nak bace ape yg u tules, still nak tgk u dress up mcm skrg. org cm org yg mengutuk tu mmg xreti bahase dan bodo betola sbb xde sape nak tgk die tules cmtu. die je syok sendiri. GEEEE..... THANK YOU THANK YOU THANK YOU LADIES FOR UR SUPPORT N COMMENTS!! waney dear, u gooo girl! yesss.. i couldn't agree more! this entry is very well said... i totally agree & support u! u're the same age as my sister & me n ur Along are in the same age! i know how that feels.. and couldn't be bothered pun kalau org ckp apa2..
n u noe wat, i just TOTALLY ignore wat people said!! it's just bulls**t! and whenever i receive that comment, i just accept it with a smile..
u have sooo much to do in this life, rather than to listen to those comments..i dun care if people say i'm more matured..coz i'm proud of it!! people r beautiful in their own way, and i'm super beautiful in my way..so do you,wani..
and bout ur mum,, i reallyyy like her humble stlye..i dun noe, but i really hate those rambut doraemon stlye! ur mum looks very comfortable just being herself,,and that worth millionsss! em wani..relax k..just cheer up..n forget psl budak2 senget mcm tu..anyway i dont see ur mum like that..kalau sumer org nak jadi mcm mak2 datin mcm tu tak best la dunia kan..mak member sy pn mcm ur mum..i loike ur mum style..very simple n still updated..kirim slm kt ur mum k..
utk jd mom yg cool mesti perlu nmpk mcm datin ke??? so, yg nmpk mcm datin sume for sure cool ek??? Hi Wany, been reading your blog and your sisters' as well. I thought the way you stand up for yourself against all these nasty people is very matured. Regardless, what other people said abt you, I think you dress very nicely and I LIKE UR STYLE.. I always come back to ur blog and your sister's just to get an idea. Nak buat macam mane kan? akan ade sentiasa manusia yg akan sentiasa tidak puas hati dgn kelebihan org lain. Dia kutuk u gemuk and old sebab die tak mampu nak buat baju kat Hatta Dolmat. Classic case of very dengki lah tu. Anyway, just keep on blogging ! p/s: LOVE UR HATTA DOLMAT'S BAJU! suka baca blog u n ur sister, then now br terasa nk komen. act, org pon ckp bnda yg sama kat i..
n i rs dorg suppose use word yg ok sket kot..mcm MATURED..btl tak? pedulikan la apa dorg ckp..mereka ni jeles memanjang..
even u bole beli apa yg u nak, or pakai apa yg u rs best..i x penah jeles tau..tp i happy tgk u n baca ur blog..
plus suka tgk style u..
n rs mcm nak try je..
coz im tryin so hard utk bertudung betul2(ppl keep kutuk me coz slalu on n off)hehe..
ptt bkn la kutuk..y not mendoakan kita?? kan?kan? juz ignore mahluk gila mcm ni..
wat i can observe is the uniqueness that each of u have(iza,hanis,u) intrigues ppl, some just dunno how to express it..which leads to negative thoughts and outbursts. chill gurl, just continue being urself..lead life the way it is and embrace it.manusia ni ada memcm ragam..manusia pon ada akal gak, kite yg berakal ni pepandai la filter ape yg elok ape yg tak elok..
siot gile.. im sure they're just saying it out of spite. dont worry about it. u know u look good and so does ur mom. well, akak x penah baca ur blog, err rasanya akak tlalu 'tua' utk baca ur blog yg consist of teenagers life... akak prefer to read ur sis punye, both.. hu hu..
bsabar je la wani.. alahai.. klishenye... (wrong spelling, tp malas nak check :P)..
Yang penting dear x minta pun duit satu sen..dari diorang..
i think u are cute!